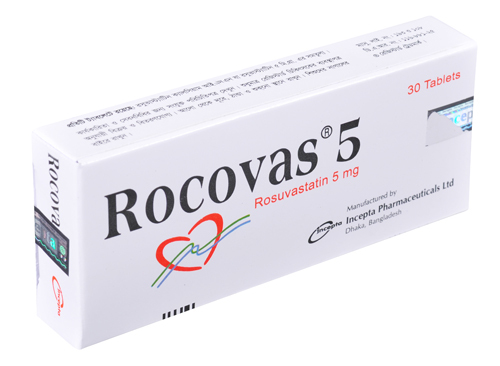 Rocovas : Each tablet contains Rosuvastatin Calcium INN equivalent to Rosuvastatin 5 mg.
Rocovas : Each tablet contains Rosuvastatin Calcium INN equivalent to Rosuvastatin 10 mg.
Rosuvastatin is an inhibitor of 3-hydroxy-3-methylglutaryl coenzyme A (HMG-CoA) reductase, the rate-limiting enzyme that converts 3-hydroxy-3-methylglutaryl coenzyme A to mevalonate, a precursor of cholesterol. 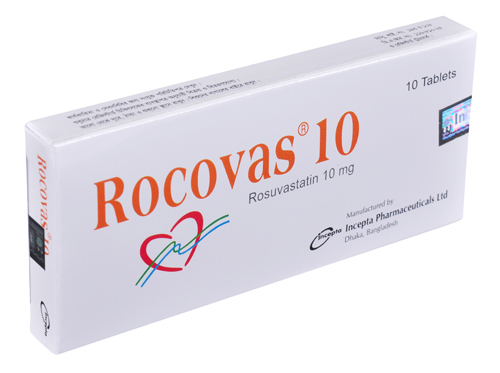 Rosuvastatin is indicated for- primary hypercholesterolaemia (type IIa including heterozygous familial hypercholesterolaemia), mixed dyslipidaemia (type IIb), or homozygousfamilial hypercholesterolaemia in patients who have not responded adequately to diet and other appropriate measures. Dose range: 5-40 mg once daily. Initially 5-10 mg once daily increased if necessary at intervals of at least 4 weeks to 20 mg once daily. Daily dose can be increased after further 4 weeks to 40 mg only in severe hypercholesterolaemia with high cardiovascular risk and under specialist supervision. Elderly initially 5 mg once daily. HoFH: Starting dose 20 mg. In pediatric patients 10 to 17 years of age with HeFH, the usual dose range is 5-20 mg/day; doses greater than 20 mg have not been studied in this patient population. Rosuvastatin can be taken with or without food, at any time of day. Skeletal muscle effects (e.g., myopathy and rhabdomyolysis): Risks increase with use of 40 mg dose, advanced age (>65 year), hypothyroidism, renal impairment, and combination use with cyclosporine, lopinavir/ritonavir, atazanavir/ritonavir, or certain other lipid-lowering drugs. Patients should be advised to promptly report unexplained muscle pain, tenderness, or weakness. Rosuvastatin can be discontinued if signs or symptoms appear. Liver enzyme abnormalities and monitoring: Persistent elevations in hepatic transaminases can occur. Liver enzymes should be monitored before and during treatment. Rosuvastatin should be administered to women of childbearing age only when such patients are highly unlikely to conceive and have been informed of the potential hazards. If the patient becomes pregnant while taking this drug, therapy should be discontinued and the patient apprised of the potential hazard to the fetus. Because of the potential for adverse reactions in nursing infants, women taking Rosuvastatin should not breast-feed.